Lansing, Michigan, became the state’s capital in 1847; in the 150+ years since, Lansing has grown into mid-Michigan’s largest city and a center for government and education. Lansing is divided into four sections: Eastside, Westside, Northwest side, and the Southside; each section sports a panoply of diverse neighborhoods. The sections roughly correlate with the flow of the Grand River, a key geographic feature that flows mainly through the northern and central parts of the city. 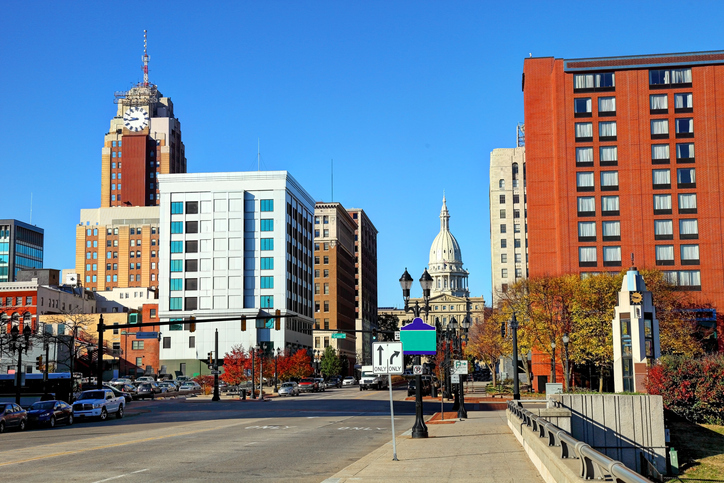 The Eastside is the most ethnically diverse side of Lansing, while the Westside is often considered the city’s most socio-economically diverse section (Westside is also home to downtown). Northwestside, the smallest of the “sides,” is home to the city’s airport, while the Southside, the largest of the “sides,” is mostly suburban and home to shopping areas. The relative largeness of Lansing means housing of all sorts is available, from old Victorians to move-in-ready contemporaries, from single-family homes in cul-de-sacs to ultramodern lofts downtown. Downtown Lansing has experienced something of a resurgence in the past decade or so. Once a haven for lobbyists, lawmakers, and lawyers, downtown now can boast 1,000 businesses, a convention center, and the ever-popular CATA Entertainment Express, a trolley that connects patrons to over 70 nightlife spots between East Lansing and downtown Lansing. Downtown is also the home of the Lansing Lugnuts, a minor league baseball team. The Lugnuts play in one of the largest Class A stadiums in the country, as their home park seats over 11,000 fans. The Lansing City Market is a 100+ year-old farmer’s market offering, among many other things, produce, dairy products, and hard cider. The Lansing Public School District is built from three high schools, six middle schools, and twenty-nine elementary schools (in addition to private and charter schools). Lansing is home to two medical schools, one veterinary school, two nursing schools, and two law schools…the Thomas M. Cooley and Michigan State University College of Law. Thomas M. Cooley is the largest law school in the country. Neighboring East Lansing is home to Michigan State University. Numerous other institutions, including the University of Michigan and Central Michigan University, have satellite campuses in Lansing. Hearkening back to the days when Ransom E. Olds founded the Olds Motor Vehicle Company, automobiles are still a critical part of Lansing’s economy; General Motors has offices and a hi-tech manufacturing facility in Lansing, for instance. Four nationwide insurance companies are headquartered in Lansing, and two hospitals – both of which have a relationship with nearby Michigan State University – employ about 10,000 people. Of course, the state is the city’s largest employer, employing about 14,000 people. When they are not going to school or working, the people of Lansing have a copious amount of choices for entertainment. Parades and festivals include the Common Ground Festival, a music lover’s dream; Old Town Oktoberfest; and Old Town’s Festival of the Moon and Sun, a two-day party of eating and live music. There’s the Potter Park Zoo for some animal-spotting, the Lansing Art Gallery for appreciating Michigan’s artists, and the truly unique Michigan Museum of Surveying, the only museum on the continent solely dedicated to surveying and mapping. Parks are abundant, and provide the usual array of opportunities and facilities: basketball courts, baseball diamonds, walking trails, playscapes, tennis courts, and picnic shelters. The Lansing River Trail was recently named one of the Top Ten Nature Runs in the US by Women’s Health Magazine.